Criminalize Conservatism: Is Stealing Elections The Conservative Way? Is Stealing Elections The Conservative Way? It's common knowledge now that the 2014 midterm election turnout was the lowest since 1942 - right after Japan joined Germany in World War II, when Americans were preoccupied with the war effort. But since the election, we've found out that the Cons were up to their usual tricks: stealing elections, the thing they do best. Is stealing elections the Conservative way? It's done through the usual lies and distortions, but more importantly gerrymandering, enhanced voter ID laws, voter suppression, vote intimidation, and miscounting the votes. 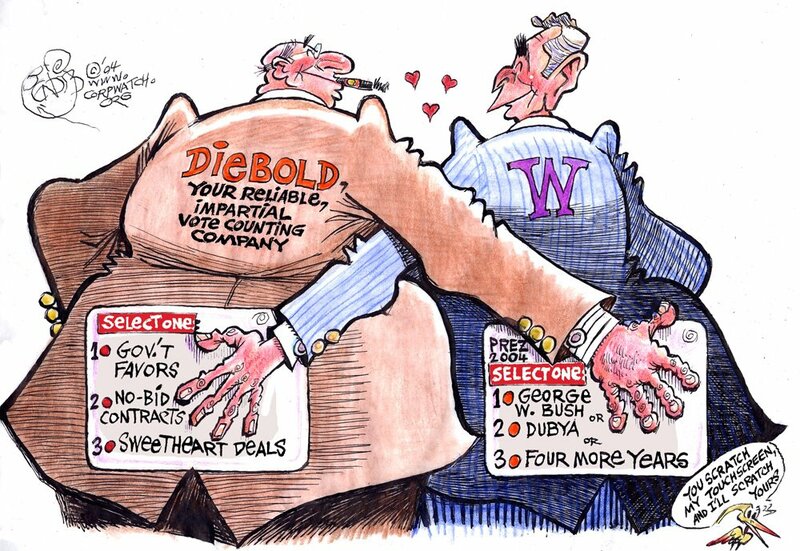 "Election 2014: Surge or Theft?" "How dark money and voter disenfranchisement combined in a toxic brew that resulted in the lowest voter turnout in more than 70 years, hampering whatever chance Democrats had to win. "First, Americans didn’t overwhelmingly choose Republicans over Democrats; if anything, they overwhelmingly voted 'no' on both parties. Midterms always produce lower turnout than presidential years—but turnout in 2014 drew just 36 percent of the electorate. That’s not just off-year low—that’s the lowest turnout rate since 1942, the middle of World War II when nearly eight million voters were in uniform and absentee balloting was rare. "In the North Carolina race for U.S. Senate—at $107 million, the most expensive statewide race in American history—state House Speaker Thom Tillis beat Senator Kay Hagan by a margin of 1.7 percent, or about 48,000 votes, under one of the harshest new election laws in the country. It’s a law that Tillis himself helped craft, that eliminated seven early voting days and same-day registration, and prohibited voting outside a voter’s home precinct — all disproportionately likely to affect student and African-American voters. In North Carolina’s 2010 election, 200,000 voted in the early voting days, while in 2012 nearly 700,000—including one-quarter of all African Americans voting in the election—did, as well; this year that was illegal..."
"...The list goes on—all told, so far, nearly a quarter-billion dollars in dark money, nearly 70 percent of that to support Republican candidates, has been officially reported. Then on top of that quarter billion was an additional $50 million spent by the super PACs that must disclose their donors, allowing the rich to bypass limits placed on what they can give individual candidates directly. "Dark money, voter suppression, an electorate unwilling to show up at the polls—these are not reason for optimism among Democrats two years from now, whatever happens in Washington between now and November 2016..."
How do the Cons keep winning if the're always wrong anyway? "The REAL Reason The GOP Keeps Winning: Lies, Fraud, Vote-Rigging, And Treason (VIDEO)." As the Democrats’ stunning midterm losses prompt much soul-searching and finger-pointing, we ignore the real reasons the GOP keeps winning: Lies, fraud, vote-rigging, and treason. How else do we explain why the majority of Americans support policies promoted by the Democratic party, but keep electing Republicans to our federal, state, and local governments? LIES: The modern GOP’s true agenda is so destructive, cruel, and repellent, their politicians are forced to either cloak their true beliefs in a gauzy haze of old-timey “family values,” evoke and exploit subliminal fears of “those people,” or flat-out LIE. For example, GOP rising star and Senator-Elect Joni Ernst (R-IA) lied about supporting an anti-choice “personhood” amendment during a debate, while Senate Majority-Leader-To-Be Mitch McConnell (R-KY) denied wanting to privatize Social Security. FRAUD: Despite all those GOP lawmakers’ squawking about voter fraud, a shocking report by Bill Bennett from Addicting Info reveals that Republicans are responsible for the majority of voter fraud incidents! For starters, supporters of TX Gov. Rick Perry and that doughy, thrice-divorced, “family values” hypocrite, Newt Gingrich, alone turned in a combined 14,000 false petition signatures on their behalf. And that’s just the tip of the iceberg. And who can forget Florida’s purveyors of “hanging chad” back in 2000, who screwed America by sticking us with the absolute WORST president in U.S. history. 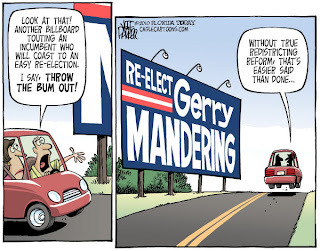 VOTE RIGGING: Back in 2013, Rachel Maddow walked us through the GOP’s sneaky REdistricting MAjority Project (REDMAP) plan for overriding our nation’s Democratic majority by gerrymandering safe seats for themselves at the local, state, and federal levels. Then, right-wing Supreme Court judges gutted the Voting Rights Act, so GOP lawmakers could pass bogus Voter ID laws to block low-income folks (mostly of color) from voting! 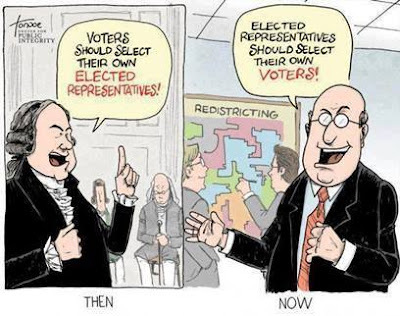 Oh, and now Republicans are working on “reforming” the Electoral College so they can steal the White House in 2016. TREASON: Oh, and let’s not forget about all the flat-out treason Republicans have committed. Radio host Thom Hartmann reminds us that not a single Republican since Dwight Eisenhower has won the White House through legitimate means! Seriously. In 1968, Richard Nixon narrowly edged out Democratic presidential candidate Hubert Humphrey by thwarting then-President Lyndon B. Johnson’s attempts to end the Vietnam War. Nixon actually sent envoys to South Vietnam and persuaded them to cancel an upcoming round of peace talks. Then VP Gerald Ford stepped in when Nixon resigned in disgrace. In 1980, Ronald Reagan engaged in similar treachery to unseat Jimmy Carter, by engineering the “October Surprise” — an arms for hostages deal that scuttled Carter’s ongoing negotiations with Iran for the American hostages’ release. Then George Bush Senior rode in on Reagan’s coat tails. And then, of course, there’s the “hanging chad” year in which the notoriously corrupt State of Florida — with help from the bought-and-paid-for, hard-right ideologues on the U.S. Supreme Court — handed our country over to George W. Bush. ...because that's what the GOP does best. How many of you have seen any of this stuff on your local news or morning newspaper? How many of you would like the American public to know about how the Cons steal elections? All ofus would, but it won't happen...unless we criminalize Conservatism first.